You'd be forgiven for feeling a little Star Wars fatigue. Now three movies in, Disney have pulled out all the stops to cash in on the franchise, and they've officially reached a marketing glut. It's at the point where we're watching Star Wars-branded Canadian Tire commercials about Storm Trooper toasters before Star Wars-branded Nissan commercials as we wait for the trailers to start. And that's not to mention the Porgs — the latest characters begging to be merchandised, part Minion and part Beanie Baby. It's no wonder their name sounds like "Pogs." It's all enough to warrant a collective sigh at the arrival of another entry in the series — but don't let ennui cloud your judgement. The Last Jedi is a stunning achievement that offers a barrage of jaw-dropping scenes, emotive drama and a strong sense of purpose. It's the first new Star Wars movie that truly feels like a new Star Wars movie and not just a solid piece of market-tested fan service. 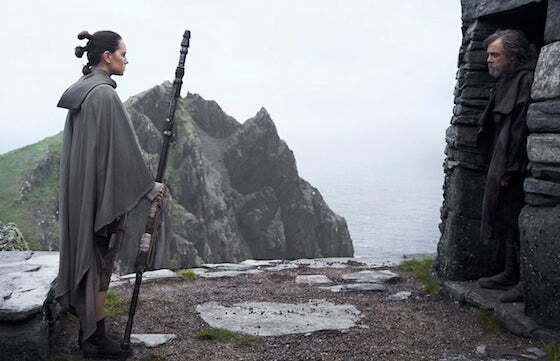 Credit Rian Johnson for that; he's managed to cram eye-popping visuals and heart-swelling morality into a 153-minute film that will never have you checking your watch. The setpieces are magnificent, the score is outstanding, the battles are explosive and the battle between good and evil is as palpable as ever (even if, in fitting with our confusing times, the enemies are occasionally caught in a moral grey zone). That's not to say it's without its problems, particularly with the hit-or-miss CGI characters. The aforementioned Porgs eat up far too much screentime with cheap visual gags, and an otherwise incredible casino scene is deflated with a hammy, coin-grabbing leprechaun dude. Further, though she only appears in one scene, we could still do without the overly slick animation of The Force Awakens' unnecessary character Maz Kanata.